Tough fishing today. We set up in the 00’s in 130 fow. The temp was 61 down 110 feet and 58 on the bottom. We trolled north and moved out a little deeper. In 180 fow it was 48 degrees down 160 feet. We were marking bait & fish down there, but couldn’t get a hit. We took it down to the middle of th 02’s , turned and trolled sw. We were two hours into the trip before we has our first bite. It came on a 450 copper with a Magna Glow Blue Momba Kingfisher Flasher/Blue Moo Big Water Meat Rig. We fought it for a while, but it got off. We kept on that same troll until we quit fishing. We ended up in the 39’s and 57’s. We only had six bites all morning. Five of the bites were on meat rigs and one on a 350 copper with a glow spoon. We ran some plugs on coppers and started out with spoons on our out downs, but after our first few hits came on meat we took the spoons off the riggers and replaced them with 10″ Spin Doctors and Big Water Meat Rigs. We left out two plugs, but they never went. We had three wire diver bites. A low wire out 215 with a 10″ Show Time Spin Doctor/Blue Moo Big Water Rig and a 10″ Dark Green Blue Bubble Slick Spin Doctor/Green Mile Big Water Rig out 205 on the other low wire each went once. A 10″ Black White Crush Spin Doctor/Moo Moo Big Water Rig out 300 on a high wire went once too. A 10″ Margarita Spin Doctor/Green Mile Meat Rig took a King down 100 on an out down. From the amount of bait & fish we marked it looks like when the Lake settles down we are in for some good fishing. We use Erie Dearie Premium Strips on all our meat rigs. The fishing is about the same as it was on last Friday’s report. We set up in the 00’s in 120 fow. It was 52 degrees down 110 feet. We only had one bite in the dark and there was no morning flurry. The action was never hot, but we didn’t go too long without a bite. Four of the eight fish we landed came on a 11″ White Crush Spin Doctor/Pickled Sunshine Action Fly. We had one on the chute rigger between 110 & 120 ft. and one on an out down set at 100. We tried several set-ups on the other out down, but it never went. We took a nice Brown Trout on a 300 copper with a Yellow Splatter Back Captain’s Choice Cut Plug and we had two other bites on it. We took a King on a 250 copper with a 10″ Dark Green Spin Doctor Blue Bubble Slick/Green Mile Big Water Meat Rig on a 250 copper. We had the same Spin Doctor/Meat Rig on a low wire out 200 and it went four times. Our other low wire out 215 was a 10″ Show Time Spin Doctor/Blue Moo Big Water Rig and it went four times also. No bites on our high wires. 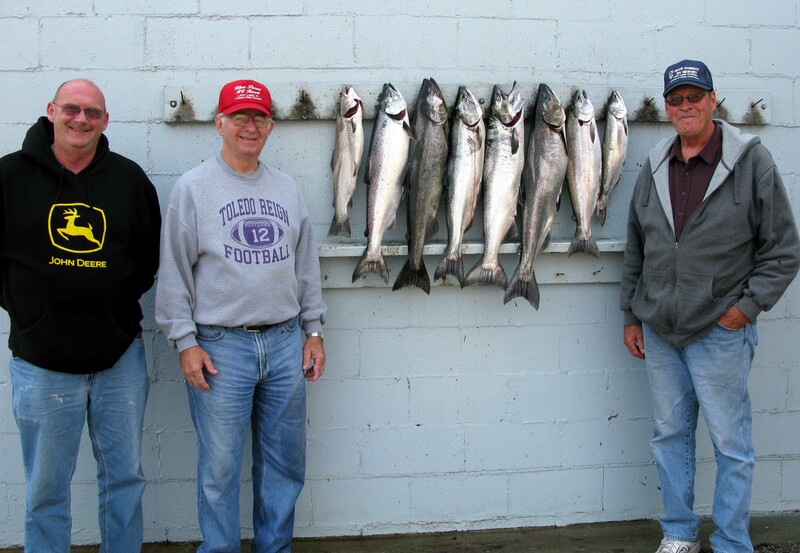 We fished between 130 & 180 fow. 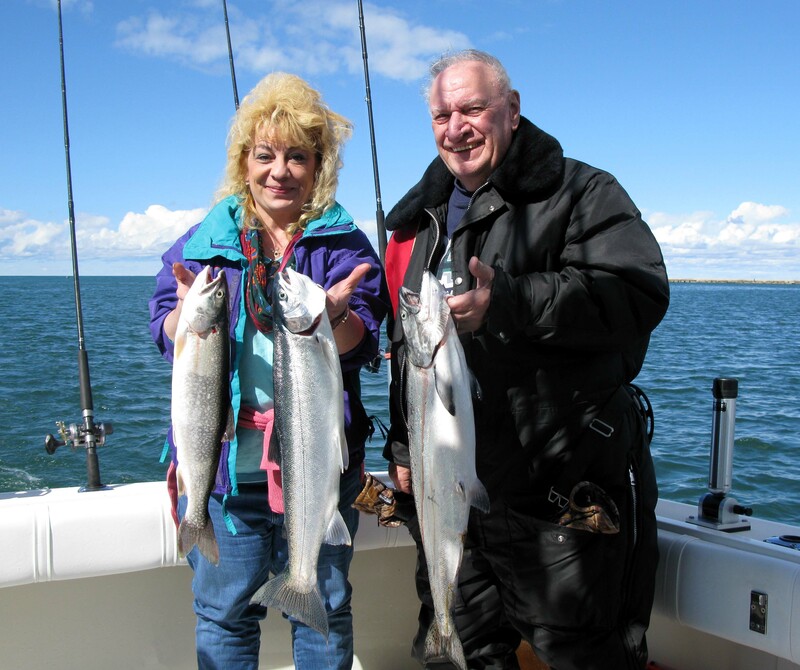 On our first pass north we marked lots of bait and fish on the bottom 30 to 40 feet in 130 to 150 fow. It was hard to get a good upwind troll. The wind picked up significantly about a third of the way through the trip and the waves were approaching four feet. If the Lake would not have gotten so rough I think we could have had a few more fish. My next scheduled trip is on the 26th of this month. We use Erie Dearie Premium Strips on all our meat rigs.